Chevy Silverado double cab courtesy of Ed Koehn Chevrolet! Sign up at CSBrew at the bar…or download registration form HERE and stop by to drop it off at the bar or mail it in (PO Box 34) with a check (must be received by August 10). Join us on Saturday, March 4th, in the morning for Fermented Yoga with MVP professional instructor, Danielle Young! Doors open at 9:00 am and class begins at 9:30 on April 22nd, followed by the beverage of your choice at 10:30 a.m.
Open to the first 35 guests aged 21+ only. That our employees can spend time with their families, we are open on Christmas Eve from noon to 3 p.m. with draft service ONLY…growler fills, gift cards & glassware. The kitchen will be closed. We are closed Christmas Day. Come joint the fun at your friendly, neighborhood Brewing Company this Saturday as you stock up on a few Cedar Springs Brewing Company gift cards for all those elves on your shopping list. 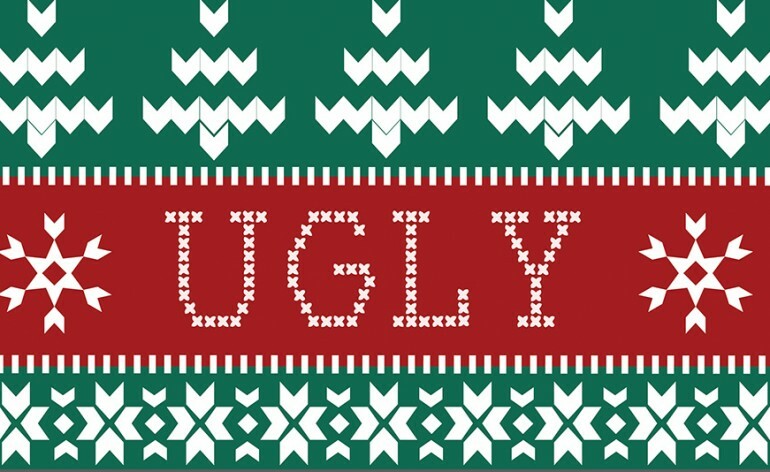 Grab your best holiday attire and head down to see the crew at CSBrew….they’ll check out your fancy threads and will name a “winner” from among their favorites. Gift cards awarded to the staff choice for the “best” and the “ugliest” gear in town! Join us this Saturday as we celebrate “Small Business Saturday” by shopping local and supporting our community businesses. Stop by our neighbors at Coldbreak Brewing Supply and visit our brewery store for 10% off all Cedar Springs Brewing Merchandise Saturday, November 26 ONLY. 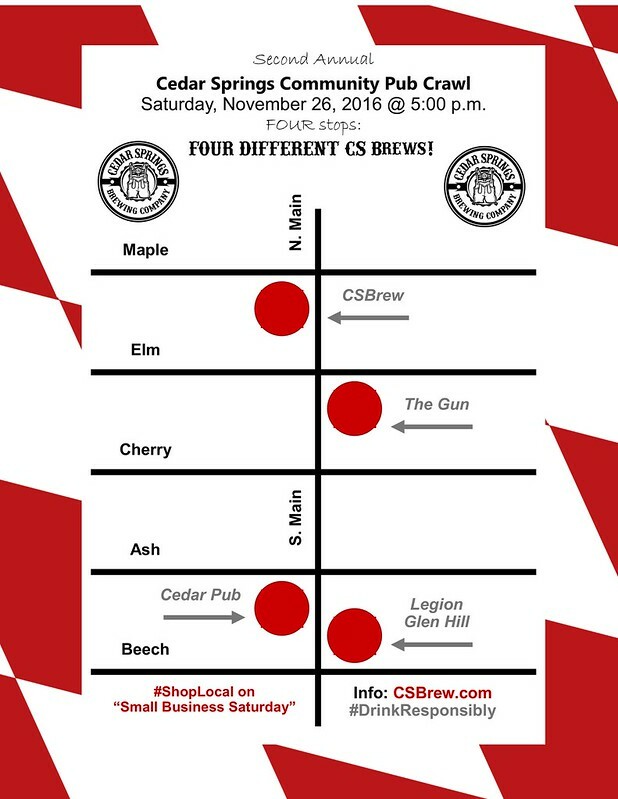 Store is open from 9 a.m. to 7 p.m.
Join is Saturday evening for our Second Annual “Pub Crawl” as we have a distinct Cedar Springs brew on tap at each of our local watering holes, beginning at 6 p.m. Take the tour and say hello to all your friends & neighbors! Can you believe it’s been a year already?!? We’d like to invite you all to stop by the weekend of November 4-6 to help us celebrate ONE YEAR of Gemütlichkeit in Cedar Springs! * Cedar Springs Brewing is the premier German-style brewery in the area and one of the few in Michigan focusing on Bavarian beer styles and cuisine. Our Küsterer brand is a reference to the original German brewer in the region, dating to 1844. The family founded the first Grand Rapids Brewing Company in 1892. * Küsterer Original Weissbier was featured as MLive’s “Beer of the Week” in July 2016. * CSIPA was featured as MLive’s “Beer of the Week” in August 2016. * Our Community Give Back Program, donations and local fund-raising has generated over $5,000 for our community! We’ve seen the Community Building Development Team break ground on the new “Heart of Cedar Springs“ next door. * Küsterer Bier is now on tap throughout West Michigan, from the lakeshore, through Grand Rapids and up to Traverse City and Charlevoix. We remain grateful for all your support and we’ll look forward to an even better year #2! Küsterer Munich Dunkel release! This was a favorite seasonal from our opening months last year. Cask Ale releases throughout the weekend! Door prizes given away daily! Bavarian Breakfast begins 11 a.m. while supplies last. 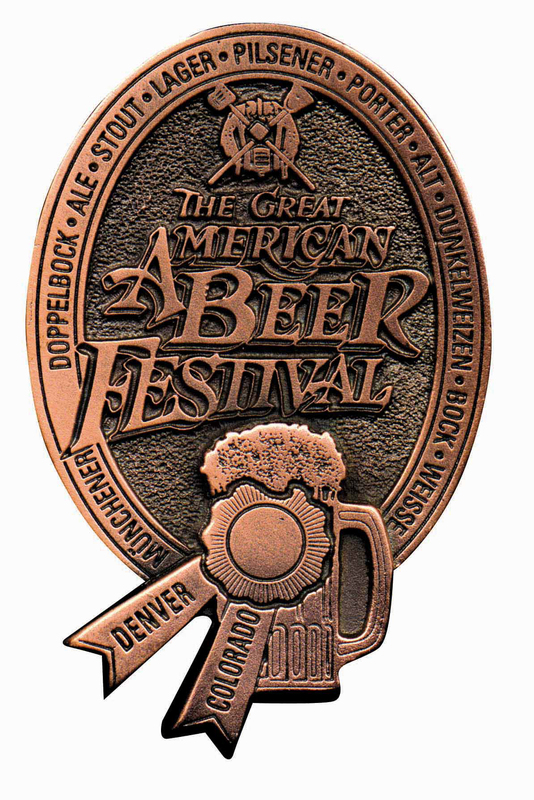 CEDAR SPRINGS BREWING COMPANY is pleased and humbled to announce KÜSTERER ORIGINAL WEISSBIER is the recipient of the BRONZE MEDAL in the “South German Wheat Ale” category at the 2016 GREAT AMERICAN BEER FESTIVAL, held this past week in Denver, Colorado. In a ceremony at the Colorado Convention Center in Denver, prestigious gold, silver and bronze medals were awarded to winning breweries in 96 beer categories covering 161 different beer styles (including all subcategories), establishing the best examples of each style in the country. Neither a gold nor a silver medal were awarded in the Pumpkin/Squash Beer category. Winners were chosen from 7,227 competition entries (nearly 9 percent more than the 6,647 entries in 2015 and surpassing all previous participation records) from 1,752 breweries hailing from 50 states plus Washington, D.C.
Küsterer Original Weissbier was the highest rated beer in Subcategory C: Bernsteinfarbenes Weizen. Silver and Gold were awarded to Dunkel Weizen and Weizenbock, respectively. Join us Friday, Sept 30 – Saturday, Oct 1! 6 p.m.—Midnight Friday & Saturday: 6 Great Bands! Special Menu begins Friday @ 4 p.m. through Saturday! Entertainment starts at 6 p.m. both nights. Bootstrap Boys – The Bootstrap Boys are a Grand Rapids based outfit laying down sweet country sounds in four part harmony with sides of rhythm & guitars since early 2015. Ben Slater – A one man band who explores all genres when equipped with his guitar, harmonica, kick drum and occasionally an accordion. Ben is sure to entertain whether he’s on stage or busking in a city near you. Jesse Ray and the Carolina Catfish – Jesse Ray and the Carolina Catfish are a 2015 Jammie award winning Rock-N-Roll band from sunny Grand Rapids, MI. Influenced by blues, punk, and rock-n-roll with a small dash country; hard hitting guitar, splitting harmonica, rambunctious drums, and crooning vocals will lay in the wake of this band’s performance. If you’re a fan of back to basics or “old school” rock-n-roll, this is a band you won’t want to miss. Jim Shaneberger Band – The Jim Shaneberger Band is a group of hardworking musicians hailing from West Michigan. Led by front man Jim Shaneberger, a skilled guitarist, bassist, songwriter, and vocalist, the band is a mainstay in the Michigan music scene. With influences like Jimi Hendrix, Stevie Ray Vaughan, Led Zepplin, and Motown classics, the Jim Shaneberger Band mixes rock, funk, soul, and blues into a sound all their own. Annagail – A folk/rock band from Grand Rapids fronted by husband and wife duo, Jared and Jennifer Adams. Annagail is that rare band of equal parts singer/songwriters and rock band that can just as comfortably hold their own playing festivals with heavy hitters or in an intimate setting leading worship. And, somehow, they make sense in all extremes. A blend of courage and frailty are embraced, and they’re proud of both. Completely capable of spanning the emotional gap from Saturday night to Sunday morning. Hazy Past – Hazy Past is a Vintage Rock band that likes to journey into many deep cuts of bands you know and love from your hazy past. Hazy Past has covered The Rolling Stones “Exile On Main Street” in it’s entirety and has performed a Led Zeppelin tribute, both at 5/3rd Ballpark and Founders Brewing Company. They have also performed an Allman Brothers Band tribute show at Rockford Brewing Co. Hazy Past plays some originals, but mostly perform covers by artists such as: Led Zeppelin, The Allman Brothers Band, Aerosmith, The Rolling Stones, Bob Dylan, The Black Crowes, The Band, Jimi Hendrix, The Doors, Pink Floyd, Santana, Pearl Jam, The Faces and many more. Stammtisch Club memberships are now available on a first come-first serve basis! To give everyone a fair shot, MEMBERS MUST SIGN UP IN PERSON at CSBrew – sorry, no online sign ups, no proxy sign ups. As many of you know, our Club has been capped at 800 members, but we are making another 200 available as of Tuesday, August 2nd…while supplies last. These are pro-rated memberships that will renew in January and expire February 1st, 2017. Members must be age 21+. Pro-rated $25 per person + $8 one time sign up fee. Memberships are currently SOLD OUT at 1,000 members. Please sign up for our email list at the bottom of the page to be notified as memberships become available again. Copyright © 2019 Cedar Springs Brewing Company. Site by CurlyHost.